As associate director of population sciences at the Penn State Cancer Institute, Kathryn H. Schmitz, PhD, MPH, is creating a thriving survivorship program. This program dovetails with Dr. Schmitz’s interest in clinical care and research combining exercise training and nutritional counseling in a behavioral oncology clinic. As such, she plans to conduct several studies on the effects of exercise on chemotoxicity in cancer patients. Kathryn Schmitz, PhD, seated, and her team demonstrate the equipment available in the Exercise Medicine Unit. 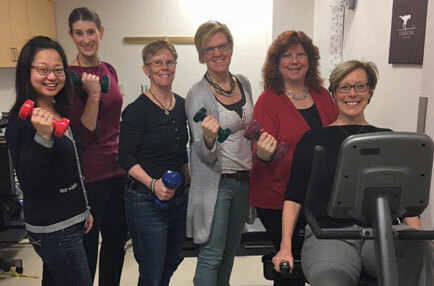 Dr. Schmitz’s TREC study explores the impact of exercise and weight control interventions on breast cancer survivors, as well as examining persistent adverse treatment effects through cost effectiveness analysis.3 Her team is currently recruiting for a pilot study on resistance training as a method to reduce dose-limiting toxicity in colon cancer patients. PhD: Kinesiology, University of Minnesota, Minneapolis, Minn.
MPH: Epidemiology, University of Minnesota, Minneapolis, Minn.
MSEd: Exercise Science, Queens College, New York, N.Y.
Schmitz KH, Williams NI, Kontos D, Kurzer MS, Schnall M, Domchek S, et al. Women in steady exercise research (WISER) sister study design and methods. Contemporary Clinical Trials. 2015; 41:17-30.
https://www.trecscience.org/trec/bin/about/overview.aspx?j=21. Accessed August 17, 2016.
https://www.trecscience.org/trec/bin/research/primary.aspx?j=21. Accessed August 17 2016.